Largest tourist island. Most developed tourist facilities such as ferry terminal, hotels, golf course, cable car tower, tourist attractions. Visit http://www.sentosa.com.sg for more details. Previous fringing reef around Sentosa which has since been reclaimed for beaches and other amenities. 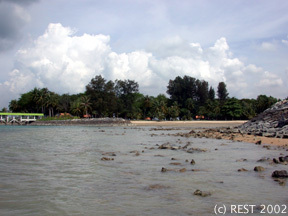 However, there is a small reef flat behind Rasa Sentosa which has some surprising finds. Visit WildSingapore for more information about its natural environment. Headquarters of the Police Coast Guard. Channel between Pulau Brani and Sentosa off limits to the public. A small island that was a former ammunition dump. There were interests to convert Pulau Tekukor into a residential area or eco-sanctuary for long-tailed macaques. Fringing reef surrounds the island. Reclamation works have linked Pulau Seringat to Lazarus Island. Size of the island including Pulau Seringat totals 47 ha. 80% of island's terrestrial habitat was left untouched in latest reclamation. However two patch reefs and much of the original fringing reef has been reclaimed. Bridge links to St John's Island. Currently no ferry service available. Was the site of fish survey conducted in 1994. 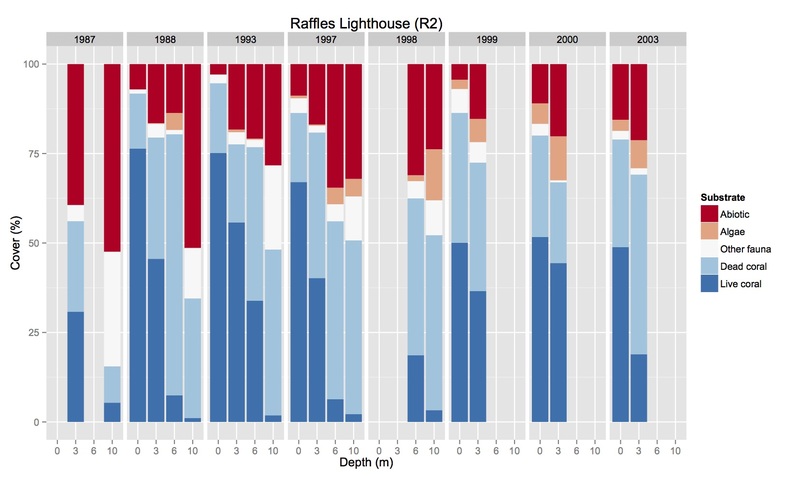 Survey data collected by the Reef Ecology Study Team. Temple situated on island. Showers and toilets available. Overnight stays not permitted on Kusu Island. Ferries to the island via Singapore Island Cruise. Fringing reefs present around the island. Many anemones with anemonefish and extensive hard coral cover. 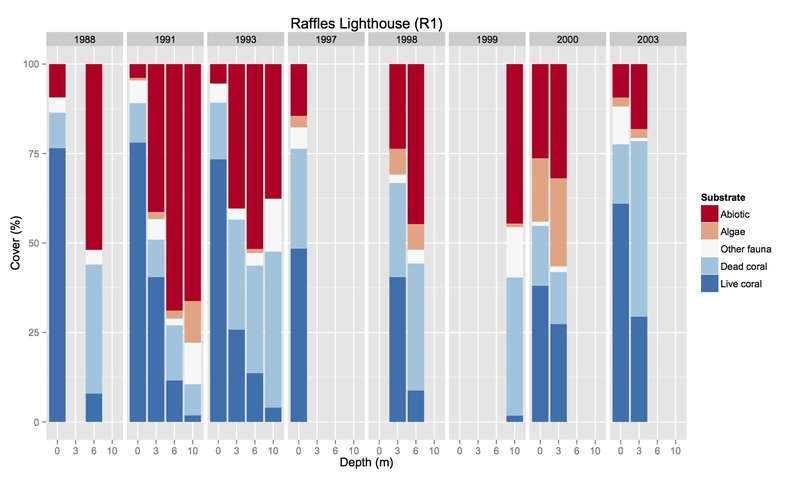 Survey data collected by the Reef Ecology Study Team and Blue Water Volunteers. Currently a recreational island with camps and chalets. Field station of Tropical Marine Science Institute and Marine Aquaculture Centre of Agri-Food & Veterinary Authority situated here as well. Ferries to the island via Singapore Island Cruise. St John's is currently linked to Lazarus Island via a bridge. Fringing coral reefs are found on the western and north-eastern edge of island. Strong currents on the western edge. Former quarantine station and drug rehabilitation centre. Also known as Pulau Subar Laut (3.9 ha) and Pulau Subar Darat (1.7 ha). These two islands are home to many species of corals and fish. It has some of the best reefs of the eastern groups of islands. The channel separating the two islands is subject to strong currents, so diving in the channel can be hazardous. At the southeastern end of the channel, however, currents are weaker, and coral cover is good and schools of fish (usually damselfish) are common. There is no ferry service to the islands, but private boats can be hired from Marina South Pier. Camping allowed with permission from the Sentosa Leisure Management Pte Ltd (Southern Islands Management). Facilities such as shelters and toilets are available on both islands. Storage for oil products and petrochemicals. Supporting services for shipping and oil tankers. Desludging facilities. A patch reef is present off its southern coast. Landfill formed by joining Pulau Semakau to Pulau Sakeng with rock bunds. Transfer station now sits on the former Pulau Sakeng. Western side characterised by mangroves facing three large sandy patch and submerged reef systems (Terumbu Raya, Beting Bemban Besar and Terumbu Bemban). Another major submerged reef, Terumbu Semakau, is located between Pulau Semakau and Pulau Sakeng, north of the landfill. Rhizophora nurseries on the northern and southern tips. Despite the construction of the landfill, Semakau still supports a sizeable and healthy mangrove. Pulau Sakeng used to be the site of a sea village (kampong laut) inclusive of several shops catering to islanders and visitors. The village was built largely on stilts over a reef flat. Most of the villagers were subsistence fishers, making a living off the nearby reefs. Pulau Semakau was home to a slightly smaller community, and even boasted a football at one end of the village. One of the oldest residents continued to live on the island even after the settlers were relocated to the mainland. He eventually moved out as well, as the jetty fell into disrepair. Construction of the landfill facilities commenced and the transfer station (built on what used to be Sakeng) was completed. The rock bunds were constructed of 5-7 layers of material and a special "geo-fabric" that is totally impervious to refuse leachates. The rock bunds linked Semakau and Sakeng, along with other patch reefs. Currently uninhabited. Jong is essentially a small tree-covered mound rising from the sea. The extensive fringing reef is cigar-shaped, extending from the northwest to the southeast. The east side of the northwestern tip drops to a depth of about 25 m. The seafloor hosts many gorgonians. Consists of 3 islands: Pulau Bukom Besar (155ha), Pulau Bukom Kechil (55ha) and Pulau Ular (35ha). Oil refinery. Up to 3000 people work in Bukom. It is very much self-sufficient, having its own fire station, tailor, barber, laundry and clinic. Pulau Bukom Kechil and Pulau Ular began operations in the 1970s. Presently there are 12 wharves in the complex. Hosts liquid storage terminals using above ground storage systems. 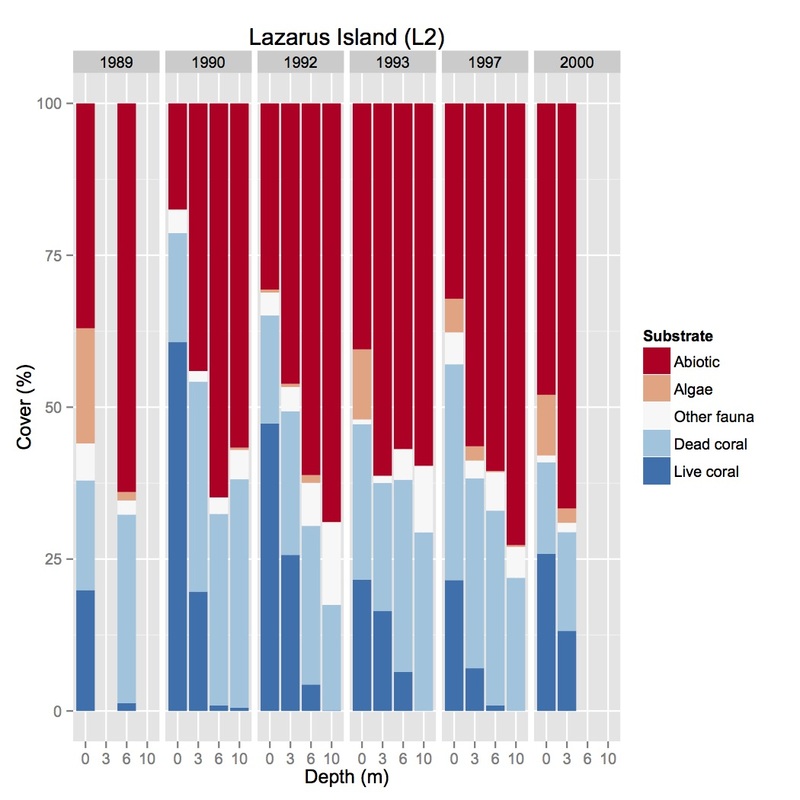 Feeding and roosting grounds for migratory shore birds. Formerly a patch reef. The island was named after a large tanker that was permanently docked at the jetty. The tanker served as the liquid storage while the island was being developed. 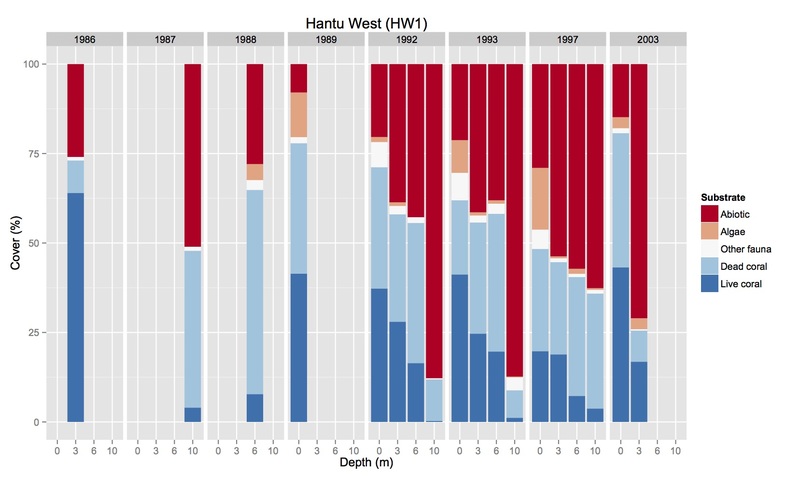 Pulau Hantu Besar used to be 2 ha and Pulau Hantu Kechil 0.4 ha, surrounded by fringing reefs with a common reef flat in between. Land reclamation during 1974-1975 to enhance recreational function increased land area to 12.2 ha using 400,000 cubic-m of sand, leaving a narrow strip between the rock bund and edge of the reef (about 20-30 m). 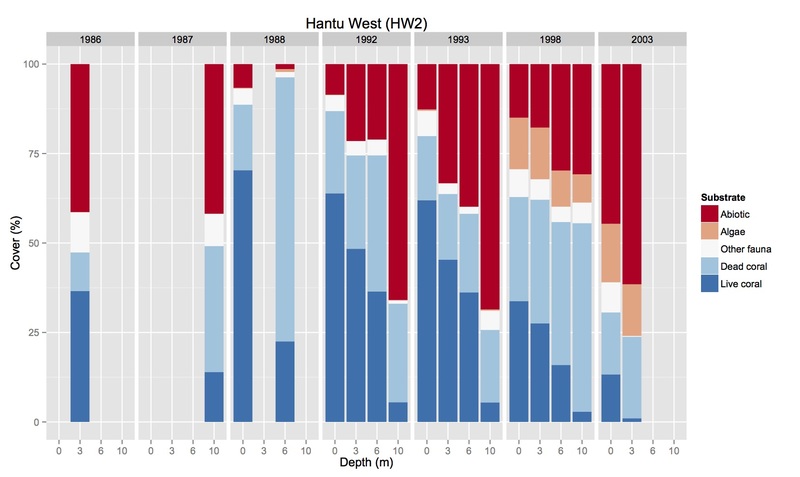 The original Hantu is actually a small patch behind the toilets (hint: look for unordered tree growth). Common reef flat buried under sand and converted to swimming lagoon, along with most of fringing reef flat covered. Extensive fringing reef and patch reef on western edge. Man-made sandy/muddy lagoon between the two islands. Look out for the resident turtle, seahorses and nudibranchs. Pulau Hantu is a recreational island. Camping allowed with permission from the Sentosa Leisure Management Pte Ltd (Southern Islands Management). Facilities include toilets, showers, BBQ pits, shelters. There is no ferry service to the islands, but private boats can be hired from West Coast Pier. Major petrochemical complex, including companies like Chevron, Sumitomo, DuPont, Exxon, Mobil, Celanese, Mitsui and Lonza. Reclaimed from seven smaller islands--Pulau Ayer Chawan, Pulau Ayer Merbau, Pulau Merlimau, Pulau Pesek, Pulau Pesek Kecil, Pulau Sakra and Pulau Seraya in 1991 to house petrochemical complexes. 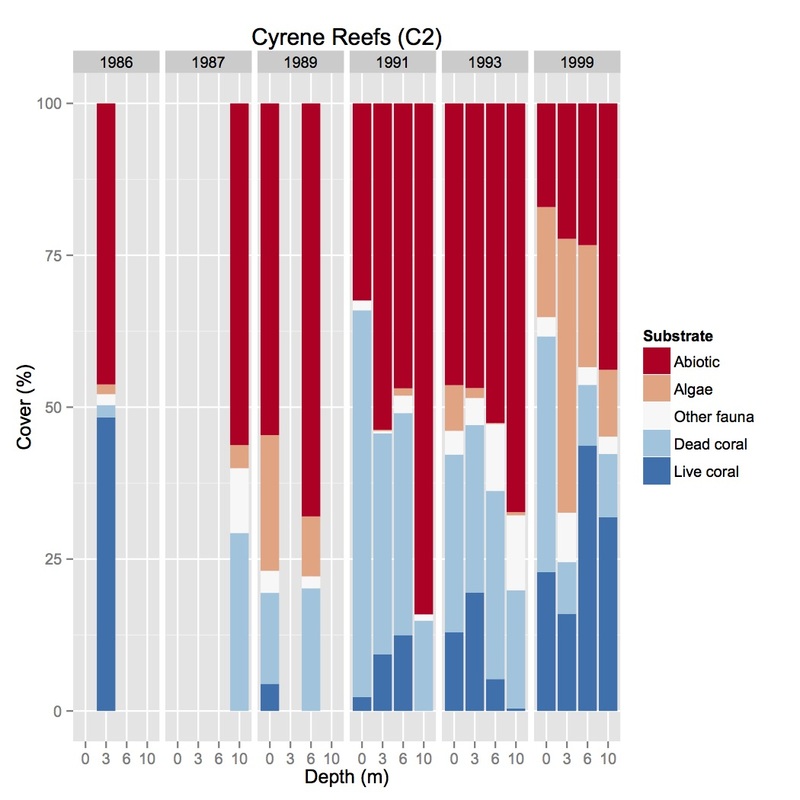 Most of coral reefs lost through land reclamation. Translocation project by Nature Society to save corals carried out in 1995--corals were moved to Sentosa. Includes Pulau Salu, Pulau Sudong, Pulau Pawai, Pulau Senang, and Pulau Biola. These islands are used for aerial live-firing exercises. Permit is needed to land on islands, with restricted access during live firing exercises. Not much is known about the coral reefs around these islands as access is restricted. 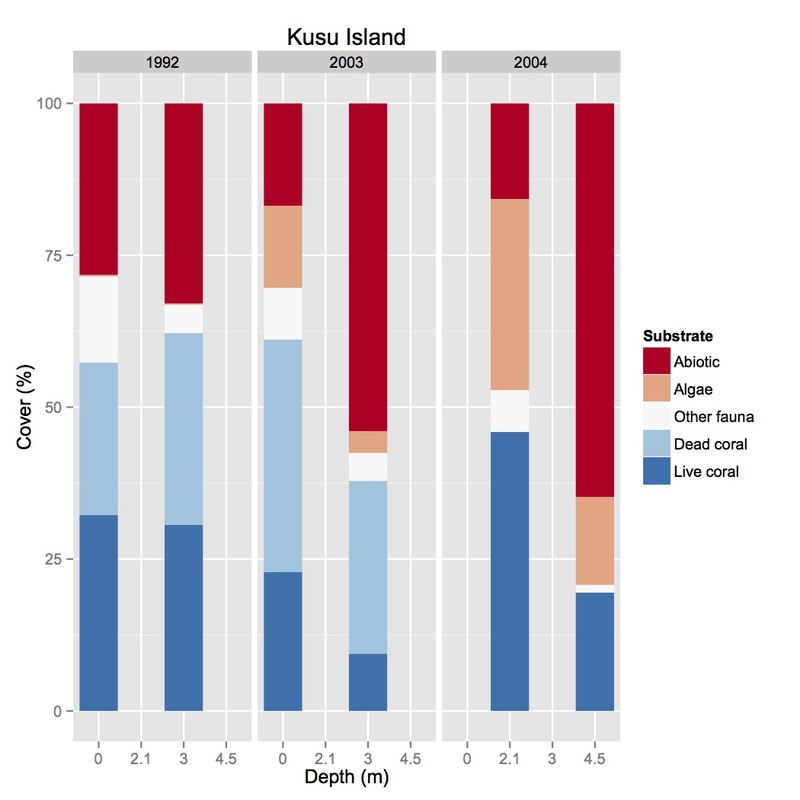 However, Pulau Salu (which was previously outside the zone) has been studied extensively in the early 1970s. 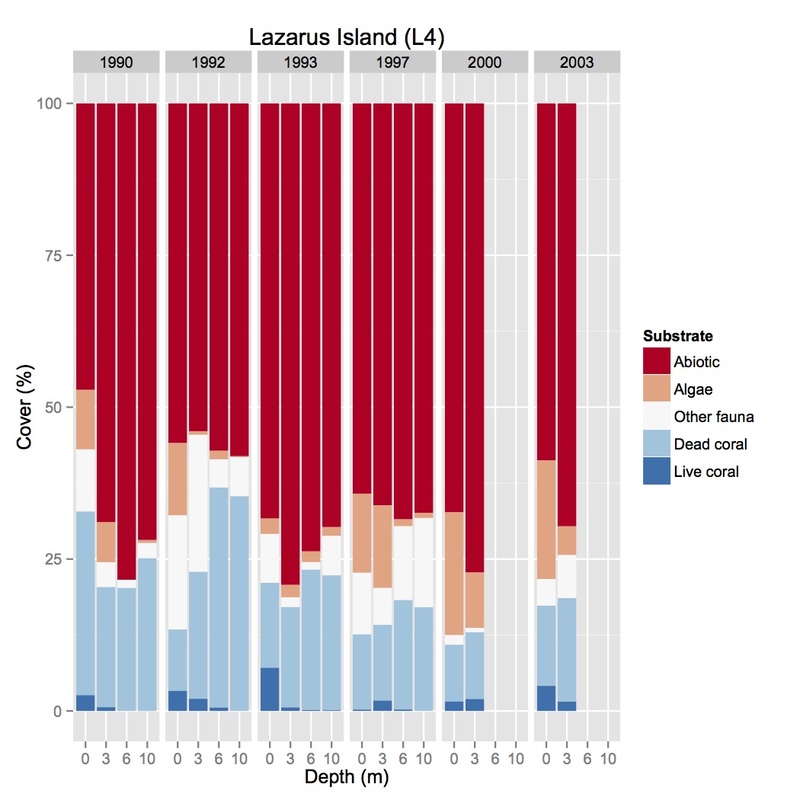 Coral reef life was found to be rich. Volunteer divers surveyed Pulau Sudong in the late 1980s and found the reef to be in good condition, probably because there was minimal coastal development on the island. 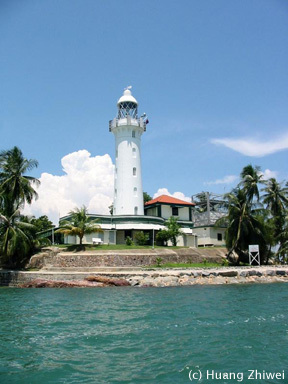 Known also as Pulau Satumu, the lighthouse was erected on this rocky outcrop in 1854. Commonly thought to be the best coral reef in Singapore as it is the furthest away from the mainland. Hard coral life is diverse and healthy--staghorn corals occur commonly on the reef. On days with good visibility, schools of damselfish, fusiliers and other pelagics can be seen. A 2-m barracuda was spotted in 2002. Landing on the island is not allowed, and more recently, access to the surrounding waters has also been restricted. Currently a permit is needed from MPA to approach within 300 m of the island. Coordinates: 103°5'E, 1°15'N; area of reef: 0.6 square-km. Comprises 3 patch reefs--Terumbu Pandan, Pandan Beacon and South Cyrene Beacon. One of the largest patch reef systems in Singapore. 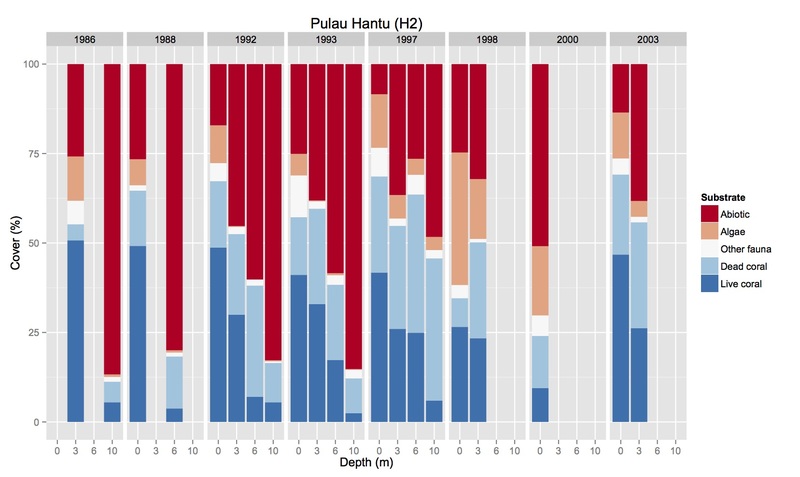 Coral cover relatively poor (~13% in 1993). Shipping channels located just adjacent to reef; also impacted by dredging at mouth of Sungei Jurong. 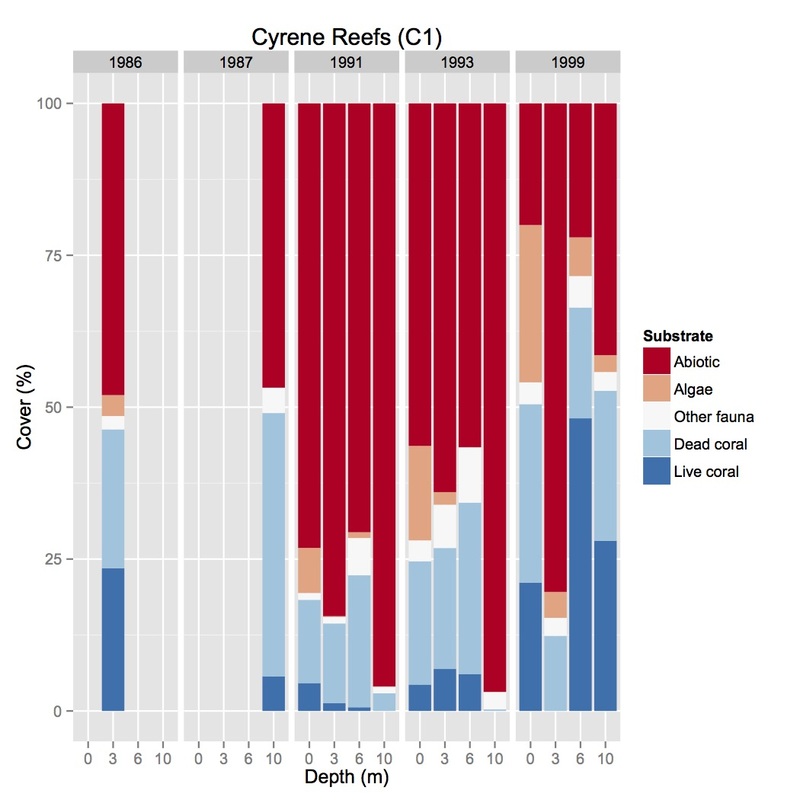 However, generic diversity is high (40 genera of hard corals). Terumbu Pempang consists of three large submerged reefs due west of Pulau Busing and Pulau Hantu. The three patches of reef are Terumbu Pempang Laut, Terumbu Pempang Tengah and Terumbu Pempang Darat. Nearly the entire southern coastline has been reclaimed or modified. The only remaining natural shoreline is a rocky shore of about 300 m in length at the Labrador Nature Reserve (Todd and Chou 2005). The western half of the southern coast is mostly bordered by seawalls, while the eastern half consists of both seawalls and sandy beaches (Lai et al. 2015). © Copyright 2013- Reef Ecology Lab, NUS. All Rights Reserved.